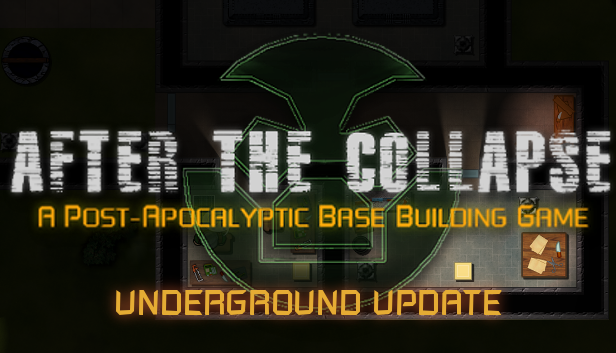 This is our first milestone update for After the Collapse, our post-apocalyptic base building game. We’ve been over most of the changes in this devlog on the official website. 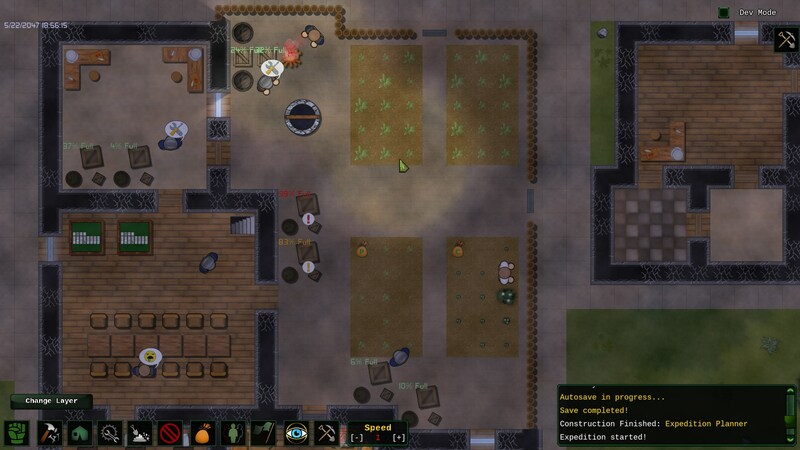 But simply put this is where we’re no longer just a cheap RimWorld clone. An underground layer has been added to the map. Dangerous caverns full of loot and hostile critters can be colonized by your survivors. The combat system has been entirely overhauled. The user interface is much easier to use thanks to better tool-tips and other improvements. 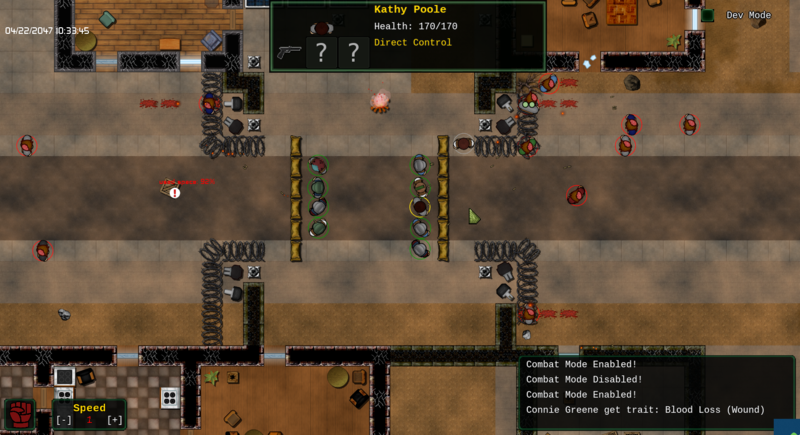 We also fixed tons of issues, did a balance pass on many existing structures, and added new enemies and events. This is only the first draft for the underground. Right now we spawn an optional cavern under the map, which you can access via stairs you can build. Sewers will be added next, and soon after the ability to start the game in an underground bunker. In any case, caverns are full of hostile enemies, loot boxes and stone (lot and lot of stones). 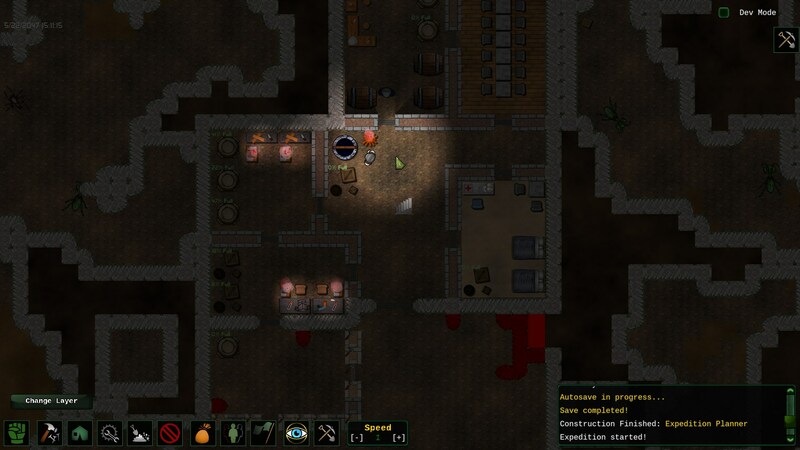 You can construct most of your base underground, well it takes some initial resources, and you’ll still need to go upstair to deal with traders, get some wood and other loot, but beside that, once secured, the underground is a good place for your survivors to claim. There’s a lot to go over. If you’re not familiar with our previous versions, the following might sound be a bit arcane. Firstly we removed the pacifist trait and the inability for depressed survivors to fight. While in theory it was a good idea, in practice, most people ended up extremely confused by the fact that some survivors would ignore orders in combat mode. Secondly we’ve added lasso selection. It’s no longer necessary to select and give orders to survivors one by one. Instead you can just lasso all your settlers and move them around like in any RTS game (or like in rimworld). It follows the standard control pattern seen in most games: shift is used to queue orders. Ctrl is used to force an attack on something your people wouldn’t normally attack. Also armor and damage has been entirely overhauled. Armors provide a percentage based protection against damage types. Additionally, weapons have a “strength/penetration” property while armors (and anything that can be hit, really) has an “integrity” property. Simply put, an attack hitting something with a higher integrity than the strength of the attack will get a proportional damage reduction. For instance a simple punch has a very low penetration, a metal wall has a very high integrity. So punching a metal wall will deal much (much!) less damage than punching another human. Please refer to the comment section in our official devlog for more details. Finally, the “military” skill is now a very important factor during combat. The higher the military skill the more likely the attacker will be to shoot at the less armored part of an enemy. As such, mercenaries and former military survivors are now invaluable in combat against tough opponents. As this screenshot shows we’re relying on tool-tips and pop-ups to convey information that would have been hidden behind layers of cumbersome menus now. You can click pretty much anything now to get a short description and how much you’d get by disassembling said object. Additionally, we added shortcut information to all our main buttons and made the skin a bit more better looking. 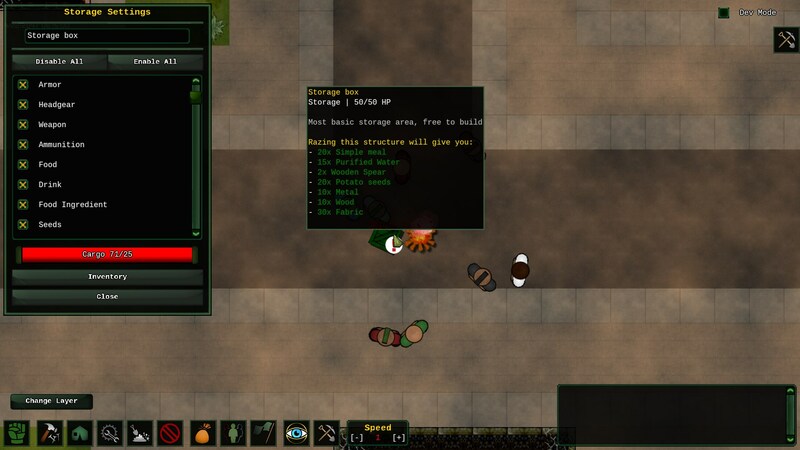 We also added icons to show disabled buildings and power conduits alongside more speech bubbles for most actions. You’ll also see an icon over depots you might have walled off by accident. As usual with the UI, it’s a work in progress. It’s improving alongside the game mechanics. 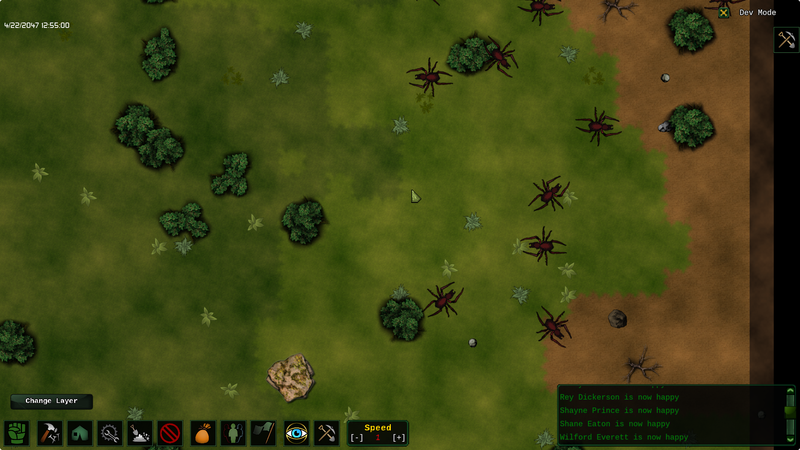 We added several new critters: giant spiders (one melee, one ranged) and mantis. The are generally roaming the underground caverns guarding the new loot. There’s also a small selection of new armors and weapons. Speaking of which, damaged gears is now it’s own category to make the inventory management easier. Several recipes have been tweaked to account for that massive amount of underground stone, and stone tables, chairs and doors have been added to the furniture list (with the appropriate technology). Water is easier to produce. Walls and floors take less time to be constructed. There’s a new loom building and cotton seeds to plant for fabric production. You can also kill spiders to gather silk that you can transform into fabric. This is where it gets a bit technical. Of course all this content, especially the underground layer, came at performance cost. If the game wasn’t running at pitch perfect 60FPS all the time for you, it will get a bit worse with 0.5. However, to balance that out, we’ve added an experimental multi-threading option. It’s in the game settings, it’s disabled by default as we’re not entirely sure it’s perfectly stable yet. If you don’t need it, don’t use it basically. However, if you do, the game will be running the underground and the city in different threads, fully taking advantage of your multi-core CPU. It was already doing so for many things (pathfinder mostly), but with that option toggled on, it will double the performances whenever possible. While we took a lot of time to design and debug the system, and managed to run several games for hours without any crash, your mileage might vary a bit. Additionally, compared to previous versions, the simulation is much more clever. Until now it was impossible to run two separate colonies completely walled off from one another, now it will handle that special case just fine. While it doesn’t sound like something you might want to do, it also mean that if something crucial gets walled off by accident, it won’t completely break down the simulation like it did in the past. Instead, your settlers will realize that this “depot/factory/item” can’t be accessed and do something else instead. It took us quite a while to get to this version. A bit more than expected, well a month more if we count the bug fixing 0.5.1 patch instead of the 0.5.0 release proper. But it was worth it. We’re in a good place. The game is stable and functional, we’ve spent a lot of time standardizing the code, so it’s adaptable and more of less future proof. 0.5 was basically our “do or die” update, either we could prove we had a solid enough system to make a coherent base builder in the long run, either, well, it died. Option one prevailed so it’s sunshine and rainbows from here on end. Well, kinda :p, let’s just say that we passed the filter where most people who try their luck at writing a base builder abandon. Anyway, next stop is to add more variety and ‘depth’ to the underground layer and a coherent agricultural system instead of that magic fire and forget thing we currently have. At least for the 0.5.x version. As for the rest you can refer to our roadmap :). As usual, you can buy the game on Steam or Itch.io (more stores coming soon). And if you’re one of those awesome people who are wondering what’s best for me. It’s counter-intuitively Steam, because doing so, you can influence the robots in my favor, and that’s a much better deal in the long run than getting one more dollar. That being said, don’t let that stop you from buying the on whichever marketplace you prefer.